For your money, the HP Omen 15 is one of the very best gaming laptops you can buy. An excellent performance, solid display and a long list of superb features make this laptop the full package for HD gaming. What is the HP Omen 15? The HP Omen 15 is a mid-range gaming laptop that packs a lot of power for the price. But unlike most under-£1250 gaming laptops, it’s difficult to see which corners HP has cut to produce such an affordable portable powerhouse. 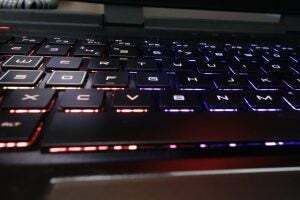 Boasting a Nvidia RTX 1060 graphics card and an 8th Generation Intel Core i7-8750H processor, this laptop can keep pace with devices that cost half a grand more. Whack in a gorgeous Full HD display with a 144Hz refresh rate, and the HP Omen 15 starts to look like one of the best value gaming laptops around. HP hasn’t skimped out on styling either. 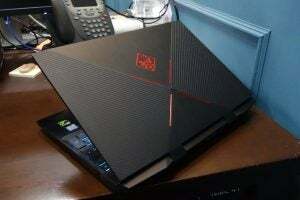 The HP Omen 15 oozes class and has no shame in flaunting its gaming pedigree. Add in a customisable Chroma back-lit keyboard, and this striking laptop looks and feels just as premium as anything that costs a grand more. There are several other configurations on offer too, with the option of a GTX 1070 GPU too. The model we’ve tested here, though, arguably has the best balance between price and power. There’s a fine line between cheesy and flavourless with gaming laptops. Some can have more lights and decor than a Christmas tree at Hamleys, while other devices lack so much flair that it’s difficult to distinguish it from a budget student laptop. The HP Omen 15, meanwhile, gets the balance smack on. The black chassis and brushed metal lid helps the Omen 15 to look both edgy and premium, while the red logo and emblem stand out just enough flair to impress without being overbearing. 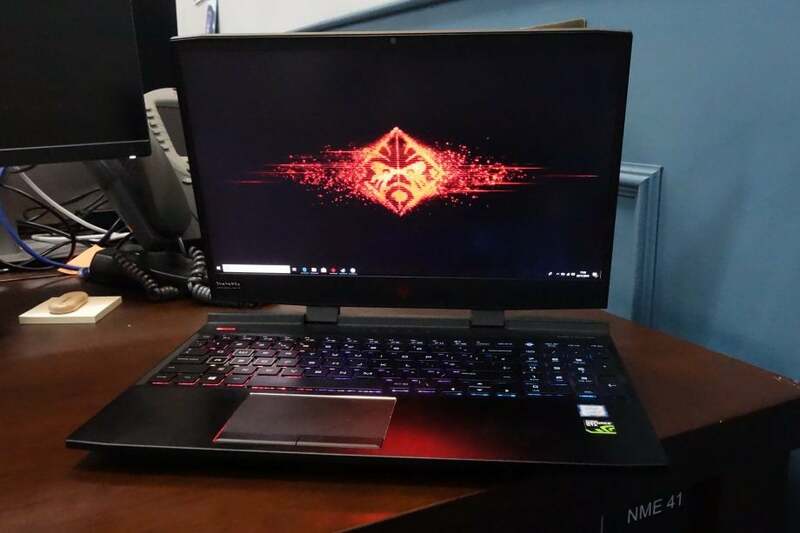 Like most gaming laptops, HP’s Omen 15 is an angry, angular red ‘n black beast. The HP Omen 15 is also one of the few gaming laptops that features an ultra-slim bezel. This contributes massively to the overall look, ensuring it looks bang-up-to-date with modern standards. I’d honestly rank the HP Omen 15’s styling up with the Razer Blade 15 as one of the best-looking gaming laptops I’ve laid my eyes upon. On the rear shoulders of the laptop, you’ll find some beefy fan exhausts. These help to reduce the risk of overheating but add a little bit of chunk to the laptop in return. At 2.52kg, the HP Omen 15 is hardly light, but it’s still thinner than most rival gaming laptops that cost the same price. I never had a problem fitting it in a bag, although its heft definitely was noticeable when transporting it across London to the office. I didn’t expect anything less considering this thing’s packing a GTX 1060 GPU. You’ll also find the speakers on the bottom of the laptop, which I always find an odd place to put them unless you like slightly muffled audio. That said, it can bang out the noise of gunfire and car engines at a very respectable volume. There’s plenty of ports on offer here too. There’s space for three USBs so you can connect all your gaming peripherals, separate microphone and headphone ports just in case you want a quality mic instead of one integrated into your headset, a USB-C offering for power-ups and an Ethernet socket so you can plug it straight into your router and avoid suffering agonizing lag. Left-to-right, the USB-A, headset and microphone ports of the HP Omen 15. The latter is actually situated on the laptop’s rear, along with the HDMI and DisplayPort which are handy for switching the action to an exterior monitor. The positioning of these ports might not seem significant at first, but it’s actually highly advantageous so you don’t have cables tugging at the laptop from the sides. This also means that a lot of the wires are hidden from view, so your desk doesn’t look like the recreation of spaghetti junction. The Omen 15’s keys are smooth to the touch and offer a satisfying ‘click’ when pressed. This isn’t loud enough to disturb your neighboring colleague at work, but there are enough feedback and travel for you to immediately know when each key has been pressed. Anti-ghosting tech also enables simultaneous key presses, so you don’t have to worry about one of your taps being undetected in the middle of a frantic shootout. Any gaming laptop worth its salt will have RGB lights under the keycaps, and the HP Omen 15 is no exception. If the design hadn’t already hammered home that the Omen 15 is optimized for gaming, the highlighted WASD keys should do the trick. Plus, you’ve got the option to activate the Chroma lighting. Hit the Omen Command Center key on the top-right, and you’ll open up a menu that allows you to fiddle with performance levels and the keyboard’s lighting. Here you can turn on the backlights, with the colours glowing through the transparent lettering on the keyboard. While you can’t change the colour for individual keys, you can switch the colour for four different zones on the keyboard: the left, centre and right, as well as the WASD keys. By default, you get a lovely orange, yellow, purple and blue combo, but you can swap out colours or even decide to keep the colours consistent across the whole board. Whatever you decide, the lighting effect sure does look wonderful. I wasn’t so impressed with the trackpad though. 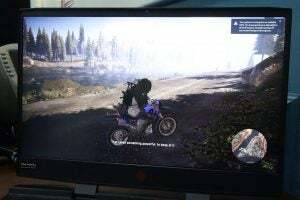 Simple tasks such as moving around the camera in Ghost Recon: Wildlands were made significantly more difficult due to trackpad being occasionally unresponsive. I even had difficulty writing this review at times, as the trackpad wouldn’t always register my taps. The HP Omen 15’s trackpad is plenty large – but sadly, it’s not terribly responsive. Fortunately, HP has equipped the trackpad with left-click and right-click buttons to make is more user-friendly, but I’m not a huge fan of those either since they’re remarkably springy. As with any gaming laptop, you’re probably going to want to dig out your mouse and mechanical keyboard to play most games anyway. One of the most common areas that sees quality sacrificed in a bid to hammer down costs for gaming laptops is the display. Both the Dell G3 and Dell G5 were guilty of this, with the mindset that you’re likely going to hook up an external monitor anyway. The HP Omen 15, meanwhile, has somehow managed to maintain an affordable price without dumbing down the display. Wildlands’ explosions were a delight to watch with popping colours bursting up on the Full HD display. Visuals don’t seem to take much of a hit when viewing the screen from an angle, either. A lot of similarly-priced gaming laptops suffer from screens with terrible viewing angles. The HP Omen 15 is a notable exception. Our colorimeter results showed the HP Omen 15’s display to be mostly on par with today’s standard, with a maximum brightness of 300 nits and a contrast ratio of 965:1. The display’s White Visual Colour Temperature was a tad cooler than natural daylight too, but that’s hardly visible. An sRGB colour gamut coverage score of 90.8% means that the HP Omen 15 offers fantastic colour accuracy, which is important for digital designers and artists. Adobe RGB and DCI P3 results aren’t so great at 63.9% and 66.6% respectively, but this laptop isn’t targeted at photographers or anyone working in physical media, so that’s not really an issue. Games look great, and that’s mainly what you need to know. The HP Omen 15 also boasts a 144Hz refresh rate. Few other laptops can make such a claim at this price point. This feature allows for a smoother on-screen performance, which is really useful for first-person shooters. Unfortunately, you’re probably not going to make the most out of that super-high refresh rate since this laptop can only offer a mid-range performance. Nvidia’s G-Sync technology also features here, which syncs up monitor’s refresh rate with the game’s frame rates in order to prevent screen tearing or distorted video. This is a really useful feature, and is really rare to find in a laptop at this price. Before I even booted up a game, I could tell that the HP Omen 15 was speedy. It breezed through web browsing tasks at a breakneck pace and never had a tantrum when I had dozens of tabs open. This slick speed is all thanks to the Intel Core i7-8750H processor. To have an i7 CPU packed into a gaming laptop at this price is mighty impressive, with the HP Omen 15 claiming speeds on par with laptops that cost a grand more. Our geekbench results proved how pacey this laptop is compared to the competition. The similarly priced Dell G5 15 can only muster half the speed of the Omen 15’s 18,134 multi-core result. Even the Razer Blade 15 is beaten for pace here with a Geekbench multi-core score of 17,092. Of course, when it comes to gaming, there’s not much use in a super-powerful CPU if you haven’t the graphics card to back it up. The model on test here has a Nvidia GeForce GTX 1060 GPU., but you can upgrade to the GTX 1070 for an extra £250 if you fancy. 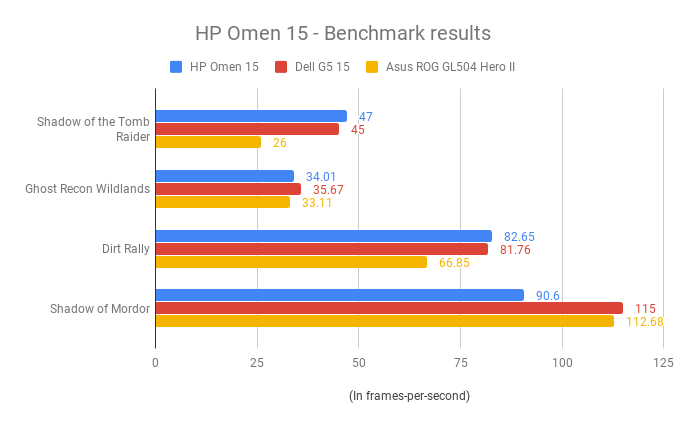 Unsurprisingly, the Omen 15 offers a very similar gaming performance to the Dell G5 15 and Asus ROG GL504 Hero II, which both also rock the GTX 1060 graphics card. The only real concern in terms of performance is that there doesn’t seem to be enough power here to make the most out of the laptop’s 144Hz refresh rate. Even the 4-year-old Shadow of Mordor can’t break past the 100 mark, so you’re going to struggle to find something relatively modern that gets close to 144fps. This means that you can play virtually any game in Full HD with the graphics cranked up to the max, including the visual stunner Shadow of the Tomb Raider. Highly intensive titles such as Ghost Recon Wildlands may only muster 34fps with the Omen 15, which isn’t ideal, but it’s still a wonder that this portable device can get it up and running at all. The fans can make quite a lot of racket when you’re pushing the HP Omen 15 hard too. I got quite a few dodgy looks in the office during my benchmark tests, so anyone who was hoping to sneak a few hours of Call of Duty during work is going to be out of luck here. The positive side of this is that the Omen 15 never seems to get noticeably hot. I’d take loud fans over a self-combusting laptop any day. The HP Omen 15 also has incredible read and write speeds at 3140.7 MB/s and 1386.5 and MB/s respectively. We’ve not seen better results than this with any laptop tested at Trusted Reviews in the last few months, even when compared with laptops for creatives. This means the Omen 15 will save and load data in a cinch. The HP Omen 15 is no different to the average gaming laptop when it comes to battery life, offering a middling 4 hours for web browsing and video playback. 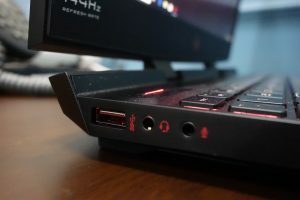 Our Powermark battery test also revealed that the HP Omen 15 can only muster two hours when non-stop gaming – and this was with the Chroma lighting turned off. You should expect a significantly shorter battery lifespan if you’ve decided to keep on the lightshow. These results mean that the HP Omen 15 is best suited to staying on your desk within reach of a power outlet. Although, the odd Netflix session on a train isn’t out of the question as long as you’re prepared for the laptop to shut down halfway through a season finale. Why buy the HP Omen 15? Looking for a laptop no more than £1250 for HD gaming? The HP Omen 15 is your answer. 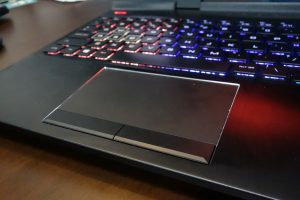 Not only is this laptop capable of playing every HD game on the market like the laptop’s similarly priced opposition, but it also has extra features such a 144Hz display, Nvidia G-Sync technology and a stylish design that makes the likes of the Dell G5 look barebones ugly in comparison. It’s hard to find fault with the HP Omen 15. It’s fantastic value and it’s shortcomings can be easily addressed. To make things even more mind-boggling, HP hasn’t seem to have sacrificed quality in other departments. OK, so the battery life is nothing special, the trackpad can sometimes be unresponsive and the fans can whip up a noise, but these issues can all be sorted pretty easily: plug it into the mains, get a mechanical keyboard and a mouse and drown out the whirring with some headphones and you’re as good as gold. That said, those are all flaws that the Razer Blade 15 simply doesn’t have, and since it only costs a little over £200 more, it’s a tempting alternative. But to get something comparable in quality to the HP Omen 15, you’re going to have to spend at least £1500 and if you’re not prepared to cough up the extra cash, then this is the laptop to buy. For the price, the HP Omen 15 is the one of the very best gaming laptops you can buy. An excellent performance, solid display and a long list of superb features make this laptop the full package for HD gaming. 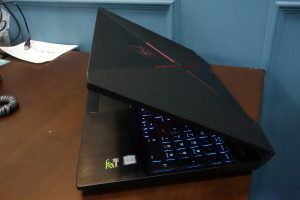 Posted in Blog, Tech Corner, Tech Corner and tagged #2018, #2019, #Aftershock, #Beast, #gaming, #HP, #mcsc, #Omen, #review, 144Hz display, 1TB HDD, bang-up-to-date design, Design, Laptop, Nvidia GeForce GTX, Razer Blade, RGB lights, The Messiah, WASD.